For all the sturm und drang, I find I haven't much more to say about the Beirut summit; it was intended as symbolic, and it has been. Rami Khouri has a good assessment. Qifa Nabki is posting links to various commentaries on today's Beirut summit. Blogger Nick Noe chimes in at Foreign Policy. And Hizbullah's al-Manar gushes about the "historic" nature of the summit (First Saudi monarch to visit since 1957!) and illustrates the excessive overuse of quote marks for emphasis. I'll try to sum up later today. Meanwhile, the picture above reminds me more of a royal audience than a state visit, but then, that's what this is. Sorry: I couldn't resist. Once again an Arab mini-summit is about to intervene to settle the future stability of Lebanon, with these two well-known Lebanese leading the way. I wish I could say there was a better way, such as letting the Lebanese settle it themselves, but since history suggests the first thing the factions do is call in their foreign patrons, I guess that won't work. 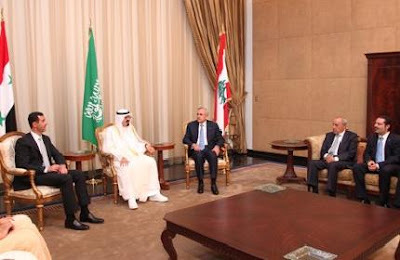 So King ‘Abdullah, trying to keep his ally Sa‘d Hariri (who is in many ways more Saudi than Lebanese) from descending into a civil war with Hizbullah (Syria serving as their advocate in the absence of an Iranian representative), come to give orders to discuss with Lebanese President Michel Suleiman what he must do to hold Lebanon together. Was it a Mine? An RPG? A Submarine Collision? More and more, it sounds as if the authorities believe the damage to the Japanese tanker was an external hostile act, though its exact nature is unclear. As this New York Times article notes, there is a history of submarine collisions in the shallow and narrow waters of the Gulf, with a US sub colliding with a Japanese tanker in 2007, and in 2009 another US sub collided with a US Navy surface vessel. But this time the US Navy says none of its subs were involved. British and French subs often deploy to the Gulf, and Iran has three Kilo-class subs; Israel publicly sent one of its subs through the Suez Canal last year; published reports have suggested it might keep one sub in the region, at least in high tension periods. Curiouser and Curiouser: Tanker "Was in a Collision"
AP is now reporting that the Director General of the Port of Fujairah is now saying the Japanese tanker M.Star was in some sort of collision (See previous story.) So thus far it has been attributed 1) to an explosion, 2) a big wave caused by a seismic event, and 3) now a collision with something unnamed. A Reuters report examines several possibilities including collision with a submarine. Hmm. 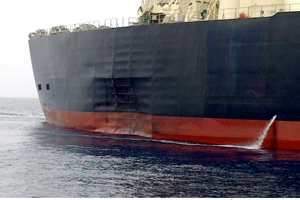 A supertanker loaded with crude can get dented badly in the Strait of Hormuz, and nearly a day later no one is sure what happened? What Happened to the Japanese Tanker? A Japanese tanker passing through the Gulf suffered what is described as an explosion yesterday as it was passing through the Strait of Hormuz, but the nature of it is unclear. AP (via Arab News) here, which acknowledges the Japanese firm suggested some sort of explosion; a fuller account in The National, here, along with the WAM (Emirates News Service) photo of the dent in the hull, which I reproduce here. The tanker, the M.Star, put into Fujairah after the blast. Obviously, I have no special knowledge of what happened, but that sure looks like an external dent in the hull, which suggests she hit a mine or something similar, which also seems to be what the Japanese owners are suggesting. The UAE’s state news agency, WAM, cited a UAE official as saying there was no possibility the damage was caused by an attack, adding that no trace of explosives was found on its outer body structure. It said a large wave that resulted from a “seismic shock” was responsible. There was no unusual seismic activity in the region, according to a spokesman for the National Centre of Meteorology and Seismology. Dr Mustafa Alani, the senior adviser for security and terrorism at the Dubai-based Gulf Research Centre, said initial investigation will focus on the nature of the damage to the ship. “It’s very easy to tell if it’s an external attack or not from whether the damage is pushing inside or internal,” Dr Alani said. So it's a seismic event, despite there being no record of seismic events? The BBC, however, is buying the "seismic event/giant wave" explanation, citing Iranian and Omani sources. So it may be a weird fluke of nature. Still, this may bear watching. The National waxes romantic about nights on the beach in Dubai, after midnight. It sounds fairly nice, since as I've noted previously, Washington has been giving Dubai a run for its money this summer, both in temperature and humidity, but we don't have nearby beaches. Of course there are some limitations on what you should be doing on the beach in Dubai, though there may be some exceptions, and there is apparently an underground culture of sorts, this article is talking about the good, clean, enjoyment of a night on the beach. Major Summit to Avert "Explosion" in Lebanon? There's talk of a major Arab summit, including both King ‘Abdullah of Saudi Arabia and Bashar al-Asad of Syria, assembling in Beirut Friday to avert a major "explosion" in Lebanon. This is all about the Special Tribunal on Lebanon (STL), which has been assembling evidence on the assassination of Rafiq Hariri. Over the past year the main finger of suspicion has shifted from the Syrian government to Hizbullah, and that could blow the Lebanese government apart, to the point that even Sa‘d Hariri has been talking about defusing things. I suspect that if indeed the STL blames Hizbullah, but the Lebanese government soft-pedals the matter, there will be some in the US who will be totally puzzled by why even the Hariris might look the other way rather than provoke a new explosion. (And some will no doubt be outraged.) Part of it is the Lebanese tradition of trying to find consensus, rather than structuring political debate in a zero-sum, two-party game. And one is the degree to which the geopolitical chessboard has has shifted since 2005. 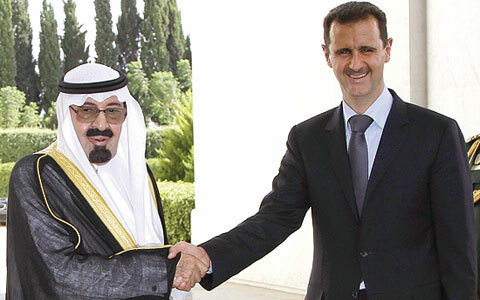 In any event, this summit is an interesting development, especially in Saudi-Syrian relations, since they seem to be singing the same tune on this one. Part of it, too, is a real nervousness that Lebanon, if it were to descend into chaos, could provoke a new Israeli intervention and a spiraling escalation. Ambassador James E. Akins has died at the age of 83. The Washington Post obituary covers all the major points: as an oil expert he predicted in the oil price spike of 1973 in a Foreign Affairs article, and was dismissed as an alarmist until, of course, it all came true later that year; as Ambassador to Saudi Arabia, he was fired by Henry Kissinger for his outspokenness. As an oil/Saudi expert he was a familiar figure around DC in the years after he left government. Is Egypt "Too Big to Fail?" Issandr El Amrani, known in the blogosphere as The Arabist, has a new weekly column for Al Masry Al Youm English. This week's asks if Egypt is "too big to fail." I think he makes an important point here. Of course there are uncertainties involved when a President has ruled for nearly 30 years and seems about to leave the scene. And Husni Mubarak has been a President whose stock in trade was caution: none of the surprise reversals and dramatic gestures of Anwar Sadat (throwing out the Russians, going to Israel, etc.) Some members of Mubarak's current regime (Safwat al-Sharif, for one) have served throughout his tenure in various positions. It has been a stable system, perhaps too stable. The military, the security services, the business establishment, the official religious establishment, and of course the ruling party apparatus and the state bureaucracy all have a lot invested in that stability. Even the Muslim Brotherhood and the opposition parties have stakes.. Some of these (the military and security services, business) are not going to allow a descent into chaos. But being too big too fail can also be a curse. Egypt’s problem is not that it teeters on the brink of an abyss, as the alarmists would have it, but that it is too complacent, too certain of a rescue, too ready to choose the path of least resistance and just muddle along. Just as financial institutions assured of a bailout can eschew necessary reforms, so can political systems. Future leadership, hopefully, will be able to both steer a course away from regional extremes and to make a clean break with an unhappy status-quo. With all the rumors about Husni Mubarak's health and the gradual fizzling out of the ElBaradei bandwagon, posters are going up around Cairo calling for the nomination of Gamal Mubarak. Though by all accounts Gamal is one of the least charismatic, most boring candidates imaginable (he's a banker, after all: watch one of his speeches sometime), and at least according to some Egyptians is not even as charismatic as his older brother, Alaa, who prefers to keep making money, he's probably already won the only primary he needs to worry about. But can the President really pull off a hereditary succession? And Speaking of Afghanistan . . .
Is Wikileaks' Data Dump the "Pentagon Papers" of Afghanistan? I'm a member of the Baby Boomer generation, and like many of my contemporaries in the media, I naturally have a tendency to draw my cultural references from the 1960s and 1970s, so I wasn't surprised to hear Daniel Ellsberg being interviewed about Wikileaks' big Afghanistan media leak.. (Well, maybe a little surprised, since I wasn't sure he was still alive.) And on top of it all, Wikileaks' head explictly compared their documents to the Pentagon Papers. So naturally, it was inevitable there would be comparisons, just as every war is compared with Vietnam. My first reaction, without having read much of the material, was that this is something quite different. Now I see, after starting to write this post, that another veteran of that era, Walter Pincus of The Washington Post, has said the same thing. What people forget is that the so-called "Pentagon Papers" was not just a big data dump. It was a history of the origins and escalation of the Vietnam War compiled at the direction of Robert McNamara: it included ancillary documents, but also interpreted them. It was also a history of the war at the level of policy formation, and so it directly revealed the thinking of President Lyndon Johnson, and of the senior policymakers, and many were shocked to learn that what the planners were planning in Vietnam was at odds with what Johnson was saying publicly in the 1964 Presidential campaign. The Wikileaks papers seem to be intelligence assessments and reports from the field, not a glimpse inside the national security policy apparatus. Of course, technology guarantees that there will be no need for another Supreme Court case such as New York Times Co. vs. United States, the 1971 case banning prior restraint. In the Internet age, once something is out there, it's out there. Of course, that doesn't mean there are no parallels. Public opinion about the war is already in flux, as it was in 1971, and if the new document dump raises questions about the conduct of the war, it could shift opinion further against it. But these are documents of a very different source, and one that non-professionals may have trouble interpreting. The Pentagon Papers came with their own interpretation. The UAE has become the latest Gulf state to wrestle with the Blackberry's proprietary encryption system which cannot be read by governments. It's getting picked up by a lot of media, but some of the headlines are a little misleading, I think. The National has the story here. A BBC version here. The Saudis and Kuwaitis have wrestled with this issue, too. And as one of the articles notes, Indian intelligence has expressed frustration at its inability to break Blackberry encryption, since the terrorists who attacked Mumbai in 2008 used Blackberries. The encryption has never been broken, and data apparently passes through Research in Motion (RIM), the Canadian firm behind Blackberry. The UAE is saying that only Blackberry stores its data offshore, beyond the reach of UAE law. It's easy to see this as a censorship issue, but mobile telephones are generally fairly easy for governments to snoop on. (I have an Android phone, so I assume Big Brother Google can learn anything it wants about me. But then, they already have pictures of my house.) Blackberry seems to be the exception. Does anyone immediately recognize (if you haven't read the title) the elderly gentleman at the right, photographed in his last year of life, aged 83? (Scanned from the memoir published in the year he died; hence the page crease.) The year was 1984, and aspects of his life were indeed Orwellian: for decades he was an "unperson." Today is July 23, the anniversary of Egypt's 1952 Revolution, and Egypt's National Day. One of the difficulties with being in my second year of blogging is that when a major date comes along like today, I have to think of something different from what I did last year, when I reflected on the 1952 Revolution, since all I have to do is hot link to that for you to reread my thoughts, and have just done so. So for this year's July 23 post, let's remember the Revolution's nearly forgotten man, Egypt's first President. Line 1 of the Cairo Metro, the first one to open, has stations named Nasser, Sadat, and Mubarak. It wasn't until Line 2 came along that Egypt's first President, Muhammad Naguib, got his station, shown at left . Naguib tends to be the forgotten President, in part at least because he endured that Orwellian "unperson" status for most of the 1950s and 1960s, and really only re-emerged in public awareness in the last years of his life, between Sadat's death in 1981 and Naguib's own in 1984. Naguib is a "strong man"—but he neither looks nor acts the part. He lives in a modest suburban house with his wife and three young sons, earns $4,000 a year, smokes cheap Toscani tobacco and drives a tiny German Opel on which he still owes three or four payments. Quiet and self-effacing, a better listener than he is a talker, he exudes an old-fashioned courtesy that echoes the prose of the Koran. How did this mild-mannered man lead a revolution in a land where corruption, disease, glaring wealth and bitter poverty are as old and as familiar as the Pyramids? "Old fashioned courtesy that echoes the prose of the Koran?" "As old and familiar as the Pyramids." Ah, Time in Henry Luce's day certainly had its recognizable style. Gamal Abdel Nasser was in the wings all along, but Naguib certainly thought he was more than a figurehead in his years in power. 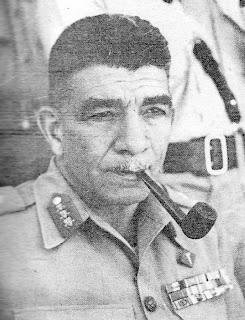 He had become something of a celebrity in Egypt during the Palestine War/War of Israeli Independence in 1948 when he (and his subordinate Gamal Abdel Nasser) were cut off by Israelis in the "Falluja Pocket" but avoided surrendering, the only slightly bright spot in an otherwise dismal performance by the Egyptian Army. 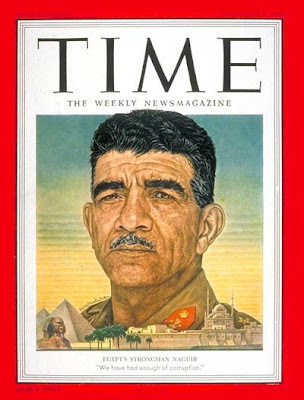 Since Naguib's fellow Free Officers ended up writing most of the history, he is usually portrayed as having been chosen as a figurehead, with Nasser holding the real reins of the Revolution from the beginning. But Nasser and the other Free Officers were young majors and colonels, and Naguib a well-known Major General and critic of the King's Men in the military. Naguib led the Free Officers to victory in elections to the Army Officers' Club in early 1952, provoking the King to cancel the results and the Free Officers to move up their coup, which they had planned for several years later. Naguib remained Prime Minister and then, on June 18, 1953, proclaimed Egypt a republic (with himself as President and Prime Minister and Nasser as Deputy Prime Minister); he remained the most visible figure. 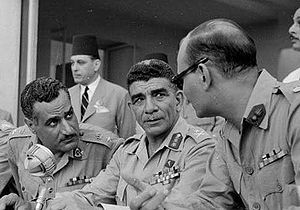 But increasingly, one notices Nasser in the photos (in the picture below right, Naguib talks to Nasser and Salah Salem). (Don't Nasser's eyes look dominating?) Still, in the surviving clips from the era, Naguib seems the mature, pipe-smoking, avuncular leader (left). Increasingly, though, the ambitious Nasser, who had been the real creator of the Free Officers (except in some of Anwar Sadat's late rewritings of his memoirs, when he tried to take credit) began accumulating the real authority, in lieu of Naguib. 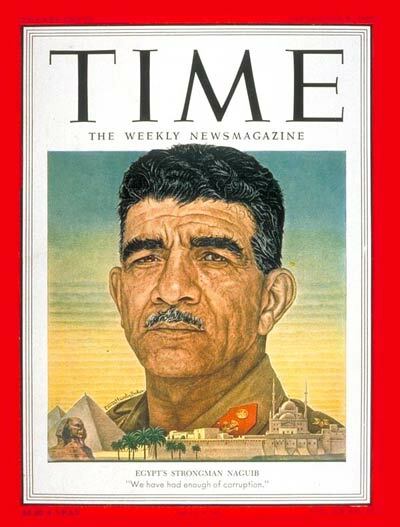 Finally, in February 1954 the rivalry between Naguib and Nasser became open; the Free Officers sought to replace Naguib but he regained power, though Nasser was given the title of Prime Minister and increasingly made all the decisions. Naguib failed to regain real authority and finally in November 1954 he resigned the Presidency as well. 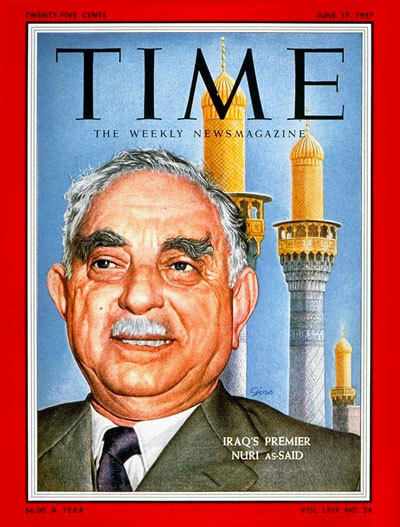 Nasser confined Naguib to a comfortable villa but under close house arrest; as the narratives of the Revolution emerged, he was portrayed more and more as a figurehead from the beginning, though it seems clear he did not understand things that way. Finally, a tribute on YouTube to "The First President and the First Victim." The soundtrack is Arabic music but you don't need to understand Arabic as it's just a stream of still photos. The Druze don't turn up here much, with only five posts under that topic, though one was less than two weeks ago, and of course, Walid Bey has his own category. But we've now had a major World Druze Congress in Lebanon, with 840 delegates from 37 countries, including 35 from Israel, who of course needed some diplomacy to get there. I hope we learn more about this pan-national Druze Congress. The Druze are — more or less by their own choice — little understood because of the secretive and esoteric nature of trhier faith, but they are a cohesive and distinct group in those countries where they have a significant presence: Lebanon, Syria, Israel, Palestine, and Jordan. From The National: Jordan Emerges as Arabic Video-Gaming Hub. I didn't know this so I thought I'd link to it. Waiting for the Amiri Movie: Double Agent or Not? I've refrained from posting anything on the Shahram Amiri espionage soap opera because it's gotten lots of coverage elsewhere and I didn't have anything original in terms of knowledge to add. Apparent defector disappears, turns up in US; two different videos show up, one claiming he defected, one that he was kidnapped. 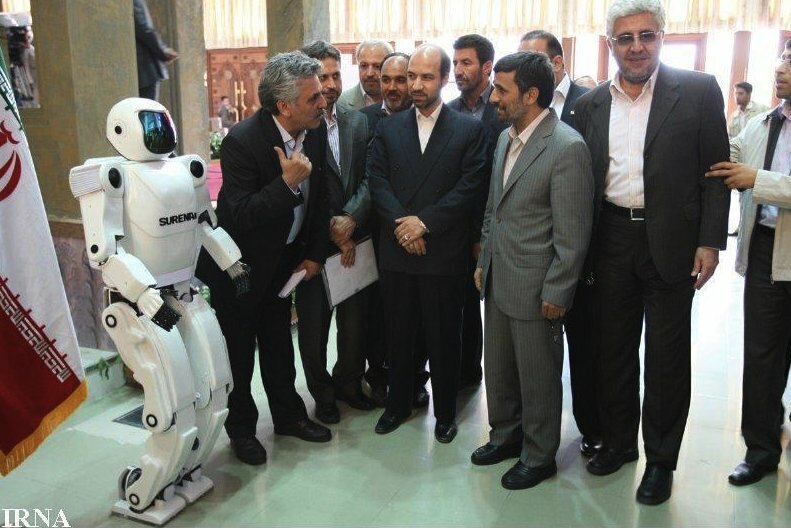 Said defector then goes back to Iran, apparently giving up $5 million the US paid him. Claims he was tortured etc. ; the US said he was working for them even before leaving Iran; but then Iran claims he was a double agent all along, and prepares to make a movie about him. In the aftermath it may be worth reflecting a bit on the still rather cloudy circumstances. So what really went on? I have no idea, but if he really was an Iranian double agent, they seem to have put one over on the CIA and perhaps the Israelis as well. If the original defection was legitimate but he did just change his mind, why would Iran now say he was a double agent? Obviously, to discredit whatever information about the nuclear program he handed over. Even if the CIA still thinks he was sincere, the possibility that he was a plant will make it hard to be completely confident about the reliability of his information. And indeed, now there are reports the CIA suspects he was indeed a double agent. If so, it suggests a real intelligence coup on the part of the Iranians. But what the real truth of the situation may be is still hard to determine. But the discrediting of his information, or at least raising questions about his reliability, is a coup for the Iranians even if the defection was originally genuine. You may have noted reports like this one, to the effect that the latest round of sanctions against Iran have made it impossible for the Educational Testing Service (ETS) to process payments from Iran, and therefore have forced cancellation of the administration of the Teaching of English as a Foreign Language (TOEFL) exams, Graduate Record Exams (GREs) and similar tests in that country. 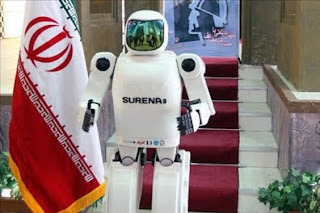 So ssnctions supposedly aimed at dissuading the Iranian government and military from their nuclear program, and at not harming ordinary Iranians, interferes with English teaching, graduate study (including in the US) and other opportunities for young, talented Iranians. It is pretty widely known, I think, how much interest young Iranians have in the US and things American, despite the whole marg bar Amrika line of the regime. Once again, because of a failure to make an exception in the sanctions for educational testing, we impede our own cause and discourage our potential friends among Iranian youth. The very people who tried to make the revolution in the streets last summer. The very people we say we are trying to encourage. Bashar al-Asad is marking ten years as President of Syria. His survival no doubt comes as a surprise for some (including some family members), but the anniversary is naturally provoking a number of assessments and summing ups. Gett5ing the most attention is probably Human Rights Watch's A Wasted Decade on the human rights record. The title seems to sum it up. More later: a busy day. Every country is unique; one problem all of us trying to educate abut the Middle East keep emphasizing is the you can't paint the whole region with a single brush. Here's an interesting example: the trials faced by circus performers. (Okay, I'm really reaching.) Last year, longtime readers may recall, during Egypt's wave of labor unrest (which has never really stopped), soon after the tax collectors went on strike, so did the circus clowns and other performers, protesting privatization of the (previously nationalized) circus. But if Egyptian circus performers have to worry about privatization, what trials might Saudi performers face? According to this story, they run the risk of being accused of sorcery. by the religious police. I suspect someday we'll see the history of TV in the Middle East as having two distinct phases: the pre-satellite era, when TV was a state monopoly and blended propaganda with soap operas and old movies, and the post-satellite era, when even the state channels had to compete with the competition. 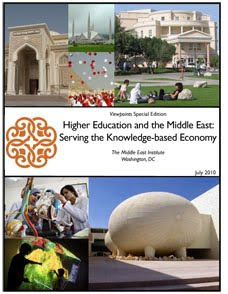 MEI has published a new publication in its Viewpoints series: Higher Education and the Middle East: Serving the Knowledge-Based Economy, by 15 authors. 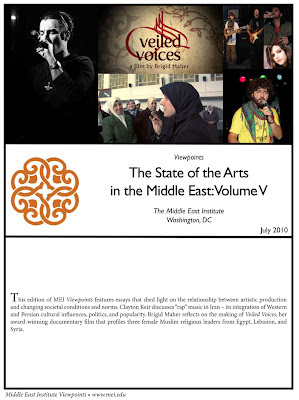 The link takes you to the descriptive page; the full PDF is here. I'm pretty busy with deadlines this morning, but at least I can refer you to some serious reading if you aren't as busy as I am. The Economist has a special report on Egypt. introduced by Max Rodenbeck, and also an assessment of the Saudi succession ("When Kings and Princes Grow Old"); and be sure to read the magazine's leader, "Thank you and goodbye," on the coming changes in both countries. I thought I'd leave you for the weekend with a couple of Cairo stories for the old (or young) Cairo hands. If you're not an old Cairo hand, you might find them interesting anyway. Secondly, let me point out an article in The National on plans to redevelop downtown Cairo, creating pedestrian-only streets and trying to restore some of Khedive Isma‘il's original vision for the central city. The plan already has its critics,warning it will make rents too expensive. I'm not sure Cairo can ever be the Paris-on-the-Nile envisioned by Isma‘il and his modern counterparts, so I'll believe it when I see it, but the old, European quarters of the city have always had a certain charm and it would be nice to see it preserved. Following the recent confrontations between Egyptian security forces and bedouin in Sinai, the government has released some 69 Sinai bedouin who had been detained, including activist Mosaad Abu Fagr, who had been held for 30 months. Al-Masry al-Youm English has an interview with him here. His description of life in Egyptian prisons is not a pretty one. Abu Fagr has been the subject of international human rights criticism and the release suggests a new sensitivity to the growing tensions between the security forces (the Interior Ministry) and the Sinai bedouin. The wilder rumor mills have been churning again; claiming that Mubarak has cancer of the esophagus, may not last out his term, etc. This is fairly typical fare for the Mideast coffeehouses, and some of it has been turning up in the Israeli press. But two things seem to have combined to persuade the Egyptian government, which usually does not comment on Mubarak's health except to praise how good it is, to openly deny the rumors. One was the report in the respected Lebanese daily Al-Safir, reporting that Mubarak was due to travel within days to Germany for a new bout of surgery (Arabic). A second was the fact that Mubarak was scheduled to meet with Binyamin Netanyahu on Tuesday. That was first postponed until Wednesday, then all the way to Sunday. This led to speculation that it was due to health reasons, especially in Israel. There is plenty of contrary evidence, mostly suggesting that the reasons for the postponement were to express Mubarak's unhappiness about recent demolitions in Jerusalem, or to avoid having a summit coincide with a possible Israeli interception of a Libyan ship sailing to Gaza via Egypt. Also, by moving the meeting to Sunday, it gives Mubarak the opportunity to meet with Mahmoud ‘Abbas first; he's coming Saturday. Part of the nervousness, too, stems from increasing Israeli speculation about what a post-Mubarak Egypt might look like. The press follows the health rumors, and recently Rabbi Ovadia Yosef, the Spiritual Leader of the rightist ultra-Orthodox Shas Party, sent Mubarak a letter in which he prayed for his good health. Given some of Yosef's past comments on Arabs, this led to some wry commentary in Egypt. My conclusion would be that the Netanyahu postponement makes perfect political/diplomatic sense, and therefore is no reason to assume the worst. On the other hand, given the region's love of conspiracy theories, the fact that the Egyptian government took the unusual step of denying these rumors will probably convince at least some that they must therefore be true. The Ashraf Marwan Verdict: "Open Verdict"
The British Coroner's Inquest into the 2007 death of Ashraf Marwan (see my post yesterday for the background) is in, and it is an "Open Verdict," which seems to be British for Damned if We Know. British press reports say the coroner "ruled out any suggestion" of suicide but found "absolutely no evidence" that he was murdered. So if he didn't jump and there's no proof he was pushed, why did he go off the balcony? The Coroner noted that the balcony wall was just 3ft (1.04m) high and said it was 'more than possible' that Dr Marwan might have leant forward and fallen over it. Dr Dolman continued : 'How did Mr Marwan leave the balcony and end up on the ground? He said that the evidence was inconclusive and the conclusion that Dr Marwan had leaned and fallen would be mere speculation. Dr Dolman continued: 'It is possible that a third party got into the flat and been threatening him forcing him over, that too is a speculation. 'There is absolutely no evidence to allow me even to consider the verdict of suicide. Confused yet? Of course, the disappearance of his memoirs, among other mysteries, suggests foul play, but clearly, whoever did it it left few clues. It may indeed take a very long time, if ever, for the real story to emerge. Fifty-two years ago, on July 14, 1958, the Free Officers movement in the Iraqi Army overthrew the government of King Faisal II (left), Crown Prince ‘Abd al-Ilah, and Prime Minister Nuri al-Sa‘id (below right, on the cover of Time). All three men died in the aftermath, Nuri being dragged through the streets. The Hashemite monarchy in Iraq lasted only 37 years, 1921-1958, and three Kings (Faisal I, Ghazi, Faisal II). At the time of the overthrow, many Iraqis saw the monarchy as a creature of the British, though both the Kings and Nuri himself had their differences with Britain in their day. A few years ago, Adeed Dawisha wrote a piece for MEJ (“Democratic Attitudes and Practices in Iraq, 1921-1952,” Middle East Journal, Winter 2005), in which he argued that the monarchical period in Iraq actually was more democratic than often given credit; this at a time when the conventional wisdom was that Iraq had never experienced any democracy. Certainly the Parliamentary period in Iraq between the wars, like the similar period in Egypt and Syria (what Albert Hourani called "the liberal age" in the Arab world) had many of the trappings of Parliamentarianism: multiple parties, elections, an independent press. It was, to be sure, imperfect. And certainly the monarchy was external, derived from abroad, imposed by the British, Sunni and Arab dominated in a country with large Shi‘ite and Kurdish populations. Oddly, there is an odd footnote here. Beginning in the 1990s, there was a flurry of discussion among some of the think tanks in this town — especially some of those that we would class as neoconservative — about a restoration of the Hashemites to replace Saddam Hussein. I felt, and most of the Iraq experts I knew felt, that this was purely moonbeams, since in a majority-Shi‘ite country with a large Kurdish population the idea of restoring a monarchy that had thin roots to begin with made little sense. I met one of the Hashemite claimants at one point, a man who seemed to know London better than Iraq, and I think the Jordanian Hashemites, especially former Crown Prince Hassan, may have been cheering the idea on. Predictably, of course, once Saddam was gone, there was no groundswell of enthusiasm for restoring the Hashemites. Still and all, for all the weaknesses and unrepresentativeness of the monarchy, given the bloodshed that began that July of 1958 and continued in coup after coup, culminating in Saddam and what followed him, the passing of the monarchy, while no doubt inevitable, was not an unqualified progressive step. Summertime Arab Coups of the 50s, 60s and 70s: Was it the Weather? I'm working on a post for tomorrow which will note the 52nd anniversary of the overthrow of the monarchy in Iraq (the July 14 revolution), and last July 23 I reflected on Egypt's comparable moment; which raises another issue: why have so many Middle Eastern coups occurred in the summertime? Is it the heat, or what? 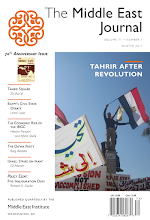 Admittedly, coups are mostly a thing of the past in the Arab world today. Syria, which had something like 20-plus coups and attempts between 1949 and 1970, has settled down to being run by Asads for the past 40 years. Other than Mauritania, which keeps the tradition alive, the last successful Arab coup was Sudan's in 1989, 21 years ago. But in the golden age of coups, a lot were in summertime. So is it the heat, or is all this coincidence? I dealt with the mysteries of the Ashraf Marwan case in passing last year, as an aside in an obituary of Mossad head Meir Amit, but now a British inquest has been reexamining the case, though reportedly its findings, due perhaps tomorrow, will be inclonclusive. This has been one of the most mysterious cloak-and-dagger tales to come out of the Middle East, worthy of a spy thriller, involving the mysterious death of an Egyptian billionaire who was Nasser's son in law, and may also have been either Mossad's greatest coup or an Egyptian double agent, or perhaps just an Egyptian agent. For background, here's his Wikipedia bio, and here's The New York Times' account of his death in 2007. But to summarize: Ashraf Marwan was an Egyprian businessman who in the 1960s married Mona Abdel Nasser, daughter of President Gamal Abdel Nasser. This opened, as might be expected, opportunities for advancement. Marwan became a trusted aide to Anwar Sadat during the latter's presidency, and remained prominent in the Mubarak years. During the 1980s, when I was covering the Egyptian defense industry, he headed the Arab Organization for Industrialization, one of its main umbrella groups. His business dealings, which included some partnerships with Muhammad Fayed, helped make him a billionaire. What else he was remains a matter of debate. For years, there has been speculation about who the "special source" was who informed Israel on the eve of the October 1973 war that an attack was imminent. Although surprise was still largely achieved, the warning prevented a complete surprise, and Israeli accounts always described the source as a very senior Arab figure. From the 1990s onward Israeli leaks suggested it was Marwan. But even when such allegations appeared in public, Marwan contnued to enjoy good relations with the Egyptian government, leading some Israelis to suspect he had actually been an Egyptian double agent. The fact that Israel was led to believe the attack would come at dusk rather than at midday was noted as suggesting the source did not tell all he knew. But sometimes conspiracies are not just theories, and finally the British decided on a new coroner's inquest int he case. The Ha'aretz story by Yossi Melman takes for granted that he was Mossad's source for the start of the 1973 war; it leaves open whether he was a double agent also working for Egypt. The Guardian talks to Mona Nasser about her husband; she blames Mossad. An account of the hearings in The Daily Telegraph notes that when he died President Mubarak said he had performed patriotic services that could not yet be revealed. And as the Wikipedia bio notes, his funeral in Cairo was attended by Gamal Mubarak and Omar Suleiman and presided over by the Sheikh al-Azhar: not how you send off an enemy spy. The conclusions will no doubt be inconclusive. But it's still a fascinating tale. The fifth in MEI's contninuing Viewpoints series on The State of the Arts in the Middle East is now online. Summary here; the full text (PDF) here. The document itself contains links to the earlier volumes in the series. An Italian military hero with connections to both the Middle East and the horn of Africa died last month (though it's taken some time to come to my attention) has died at the venerable age of 101. Amedeo Guillet, the "Devil Commander," served in Libya, commanded Moroccan troops during the Spanish Civil War as part of Mussolini's support for Franco, then campaigned in Ethiopia against the Ethiopians and the British (and is said to have led the last cavalry charge faced by the British Army). 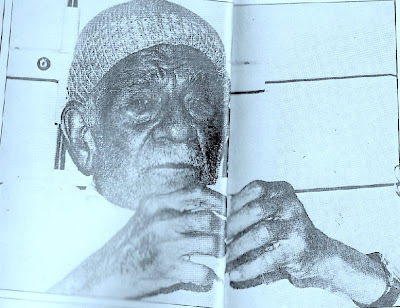 He fled to Yemen, where he befriended the Imam and lived for some years. After World War II he served Italy as a diplomat, with postings in Egypt, Yemen, Jordan, Morocco, and India. He's said to be one of the most decorated figures in Italian history. A Daily Telegraph appreciation is here; and his Wikipedia entry is here. Trouble between the Druze population of the occupied Golan Heights has been reported in the Druze town of Majdal Shams in the northern Golan. This is rather unusual. Israeli version here: violence broke out as police raided a restaurant in the town to carry out a search. Some police officers were cut off inside the restaurant for some time but were later rescued. Also see the Jerusalem Post here, which speaks of 1000 demonstrators surrounding the police until Druze elders and police negotiated a release. Arab vcrsion here (in Arabic, but even if you don't read the language click through as there's a clear photo of an overturned Israeli police vehicle): trouble also involved the home of a man arrested at Ben Gurion airport; police were held hostage for awhile, etc. The point here is that the Golan Druze have been among the more docile subjects of occupation; they are virtually the only Syrian citizens who remained in Golan after 1967. Lately there've been reports of possible Israeli settlement activity around a Druze holy site (Arabic), and there have been other tensions as well. Hat tip here to Zeinobia, for pointing me to these stories. The Navy has long been Israel's least prestigious service and it looks like they may take considerable heat for trhe mess this turned into. The Muslim Brotherhood (known in Arabic as "al-Ikhwan") is engaged in a rather curious project to duplicate some of the world's most popular websites with its own "Ikhwan" versions. So far, these include Ikhwan Wiki (resembling Wikipedia), Ikhwan Tube and Ikhwan Web Tube (YouTube lookalikes), Ikhwan Google (which searches the Brotherhood's websites) and – the latest addition – IkhwanBook which resembles Facebook. The interesting and slightly puzzling question is what the Brotherhood hopes to achieve by this. It's hard to imagine the Ikhwan sites gaining anything like the popularity of those they replicate, and they look like a move towards exclusivity which is generally uncharacteristic of the Brotherhood. I think both Matt and Brian miss the point slightly. The first reason for having all these sites — and believe me, there are a LOT of Ikhwan sites out there, practically one for every governorate of Egypt plus many more on specific issues before you reach the Facebook and Wikipedia clones — is that there simply is enthusiasm to build them. Beyond the apparent correlation one notices between tech-savvy and religious inclination (just visit any of the computer malls on Midan Sphinx in Cairo), there are a lot of young talented programmers in Egypt who would love to show their enthusiasm for the gamaa by building websites for it. And there are a lot of young people in the Brotherhood, no matter how elderly the leadership is, for whom these websites may be a way of expressing their views as well as gain practice in the art of political and religious rhetoric. The second reason is that this resonates with the groupthink and in-group mentality that the Muslim Brotherhood cultivates. These sites won't replace Facebook or Wikipedia, they are a virtual gated community (gated, that is, by strong symbolic references and imagery that are likely to alienate those not already versed in the Ikhwan universe) for like-minded people, where they can create a more orderly version of the sites that they copy and where the membership is self-selecting. The Muslim Brothers tend to socialize together, marry within each others' families, work together (or for each other) and a whole lot more. It's a support group as much as a political organization. It makes sense that, online, they will tend towards a closed ecosystem — alongside the open internet, not instead of it. They also note that when the real Facebook receives a lot of complaints about a site or user, it may take it down, and that this is used by Egyptian and other security services to attack Ikhwan sites on Facebook. I suspect at least some of these sites may have problems with trademark infringement. The URL for IkhwanBook is www.ikhwanfacebook.com, though it now just calls itself IkhwanBook. The Godfather of Muslim Punk Rock. I know I've already posted once today on Fadlallah, but in the wake of CNN' firing Octavia Nasr for a Tweet expressing admiration for the man, perhaps CNN should comment on the kind words spoken by, among others, by my count so far, King ‘Abdullah II of Jordan, Nuri al-Maliki of Iraq, and NATO Ally Recep Tayyip Erdogan of Turkey. But then, those guys don't work for CNN. Sheikh (or Grand Ayatollah depending on your views) Fadlallah's passing has of course brought out the expected huge Beirut funeral (Hizbullah's selected photos here) and some commentary that I think deserves mention, especially for Americans who saw him only in terms of the cliche "spiritual leader of Hizbullah" (which is not what he was, or at least not all he was). Fadlallah was the most prominent Arab "Source of Emulation" (marj'a at-taqlid) in Shi'a Islam, since Ayatollah Sistani is Persian, even though he has lived for most of his life in Najaf. I have heard that he had his followers among Arab Shi'a far from Lebanon, including in Bahrain and the eastern provinces of Saudi Arabia. As a general rule, Arab Shi'a have shown a reluctance to follow the religious teachings of the various Iranian Ayatollahs. It will be interesting to see the reactions in such quarters to Fadlallah's passing. Second, the always readable and wise Rami Khouri offered these thoughts on Fadlallah. I would also commend to you The Arabist, who's always good, and, via him, As'ad AbuKhalil's remarks about Fadlallah and how Americans pushed him into Hizbullah's arms. I don't often link to AbuKhalil's "Angry Arab" site because it's usually angrier than I am, but when he's on target, he's on target. If I've been slow posting, it's partly because I'm busy and partly because of the heat wave that's been plaguing the eastern US all week. The only connection this post has with the Middle East is that the weather is positively Middle Eastern: in fact Washington's highs have been tracking pretty close to Dubai's all week, in the low 100s Fahrenheit, with us probably besting them once or twice. I'm doing most of my work in the evenings, taking time away from blogging. Mubarak Medical Tests in France? The London-based Arabic daily Al-Quds al-‘Arabi suggested yesterday that Husni Mubarak's trip to France (after a stop in Algeria) may have involved follow-up medical tests after his German hospitalization earlier this year. They suggest his health is deteriorating, perhaps from cancer, and that Gamal is definitely in line for succession. Rumor and speculation ks likely to intensify as we approach Parliamentary elections later this year. The length of Mubarak's German sojourn and his long recovery have fueled speculation that something is seriously wrong, but with little real evidence to date. It's proving to be a busy week for obituaries: Nasr Abu Zayd has died in Egypt. More here, and his Wikipedia entry here. Although something of a minor player in the Islamic culture wars, Abu Zayd, an important scholar of the Qur'an, became a lightning rod in the 1990s when his studies — which sought to understand the Qur'an in terms of the era of its composition — came under attack and a hisba case was brought against him, declaring him an apostate. Since a Muslim woman cannot be married to an apostate, the court also declared the Abu Zayds divorced, forcing them into European exile. Seen by many as a martyr to rigid Islamic rules, he always insisted he was nonetheless a Muslim. You can stop sweating the nuclear thing. With their new robot project (prototype at left), it's pretty clear the Iranians are building Gort, from The Day the Earth Stood Still (below). Be afraid, be very afraid. Anyone who doesn't understand the title of this post: if you were raised outside the US you're forgiven; otherwise, you have some Googling to do. You may object they don't look much alike. 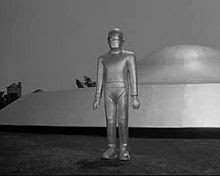 Alas, I could not find a public domain photo of Gort carrying Patricia Neal in his outstretched arms: the same position as the Iranian robot. Okay, a second prominent person is sabotaging the Fourth of July weekend by dying and making me post. As I was finishing my obit for Sheikh Fadlallah, I learned that Abu Daoud has died, too. The Guardian here; BBC Arabic here. He actually died yesterday. The man allegedly behind the 1972 massacre of Israeli athletes at the Munich Olympics, and the leader of the shadowy Black September organization, he was the prime target of the Israeli assassination campAign against Black September (on which Steven Spielberg's 2005 film Munich is very loosely based), but died in Damascus of kidney failure at 73. Unlike many PLO leaders, Abu Daoud (Muhammad Da‘ud ‘Odeh) was not a refugee from 1948, but from 1967, when he left his native Silwan (in East Jerusalem) after the Israeli occupation. A brief drop-in on the Fourth of July to note the passing of Sheikh (Grand Ayatollah to his followers) Sayyid Muhammad Hussein Fadlallah, the man usually identified in the media as the "spiritual leader" or "guide" of Hizbullah, though he had no formal post in the organization. He has died in Beirut's Suburb. 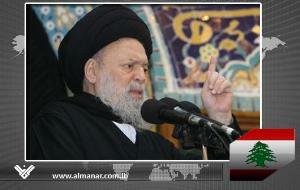 Fadlallah was a dominant figure in Lebanese Shi‘ite religious discourse and clearly had much influence with Hizbullah. BBC's obituary here; and Al-Manar's (that is, Hizbullah's) here. Wikipedia's take is here. A sharp critic of US policy in the region, he was the target of a 1985 assassination attempt allegedly backed by the United States, which he escaped but which killed 80 people. So it is ironic, I suppose, that 25 years later, he died a natural death on the Fourth of July. As we go into the long Fourth of July weekend, I'll only be posting if something major demands it. See you Tuesday. That controversy over an Israeli back-channel meeting with the Turkish Foreign Minister in Zurich, with the approve of Binyamin Netanyahu but without telling Foreign Minister Avigdor Lieberman is continuing to simmer. Lieberman is furious, though not yet threatening to pull Yisrael Beitenu out of the Cabinet. He's meeting today with Bibi to demand it not be repeated and also that the PM stop acceding to governments that refuse to meet with Lieberman. And Turkish Foreign Minister Ahmet Davutoglu is in trouble with critics as well. And since I so often link to dovish Ha'aretz, here's an op-ed from the hardline Jerusalem Post. It was probably inevitable, since already it was virtually impossible to watch any TV show about Egypt without Zahi Hawass, complete with Indiana Jones hat (excuse me, who's that? : it's the "Dr Zahi Hawass hat" and you can order one here) appearing in the first 40 seconds and dominating the rest of the program. Well, it was probably inevitable: he has his own show now, Chasing Mummies, debuting on The History Channel on Bastille Day. This could lead to an inflated ego if it had not already exceeded all standards of measurement. 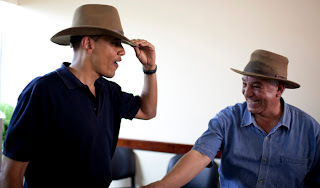 When even the President of the US poses in your hat (picure), who can avoid a swelled head? 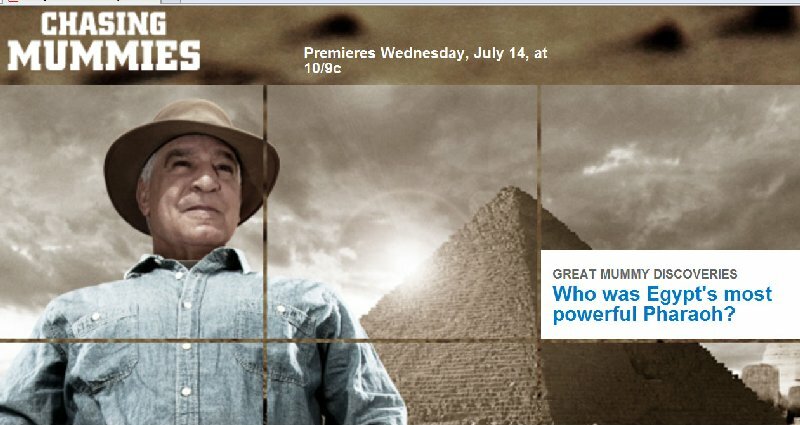 Now I've discussed Hawass before; he's certainly helped increase interest in Egyptology with a true showman's flair, an overwhelming TV presence, a website about his achievements, and an ability to overshadow every archaeologist working in the country: whoever found the site, rest assured Hawass will be the one who appears on camera. But his own TV show? Isn't this man a government employee? As I noted a while back, when my daughter learned I'd crossed paths with Hawass decades ago, she was more impressed than by any of the senior officials I might have met. So he does bring in the tourist dollars, I'm sure. That almost intrudes on Husni Mubarak's turf. Oh, yes, I can't find an embeddable version, but in an ad on the History Channel he is shown promoting the show by saying, "Show me the Mummy." In what may be encouraging news, the two policemen who allegedly beat Khaled Sa‘id to death in Alexandria have been charged, despite multiple claims by the government that he died of a drug overdose. (Earlier reports here and here.) If this actually leads to prosecution and punishment — unfortunately, a very big if — then it will be a case of the regime being pressured by public (and international) protest and pressure, and something of a victory for Internet activism. On the other hand, the charges are illegal arrest, torture, and brutality. Not, umm, cold-blooded murder.